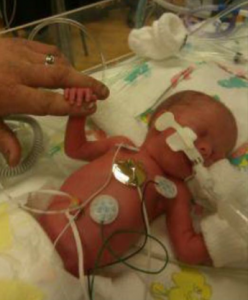 Summer was born on December 7, 2010 in Brookhaven, Mississippi at 28 weeks, which is three months premature. She weighed only 2 lbs. 11 oz. Shortly after her birth, Summer was transported to a hospital in Jackson (over an hour away) for specialized treatment. This resulted in a very trying period for Becky, Summer’s mom, who could not immediately travel to the new hospital due to her own medical issues. Although Becky’s recovery required complete rest, she was soon traveling every day to see her precious daughter. Summer was finally released on January 19, exactly one month before her due date — she had beaten all the odds and was going home a healthy baby girl. 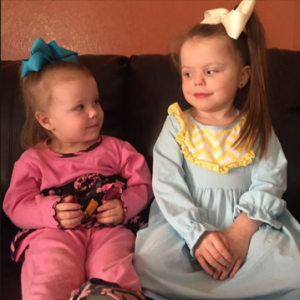 When Summer reached 2 years old, she was diagnosed with Cerebral Palsy (CP). There are many forms of this disease and walking was very hard if not impossible for young Summer. She began intensive physical therapy but after several months showed little improvement. But Becky was determined that Summer was going to walk and she never gave up on that hope. Discussions with a new therapist next led Becky to Children’s of Alabama where specialists for pediatric CP recommended selective dorsal rhyzotomy surgery. Finding out that the family would need to be in Birmingham for a month presented Becky with a new challenge. Finding a place to stay during this period was going to be very expensive – at least $2000. Wow! Individuals and organizations started fundraising for the family’s travels. Summer and her family did not know until they got to Children’s of Alabama they would be able to get a room at the Ronald McDonald House. Thanks to the room, Summer was able to have her Mommy, Daddy, LuLu (Grandmother), and Grandpapa with her. After being released three days after surgery to the Ronald McDonald House, Summer immediately started light physical therapy. Summer loved her time at the House, she was able to pick out a Halloween costume and attend the Halloween party put on by the ladies of ADPi at Samford University. Summer also got goodies to celebrate her hard work at therapy — she was given a blanket and a Frozen musical set. Summer’s favorite part of her trip was all the great places she got to visit in Birmingham — Summer was able to go to Disney on Ice! 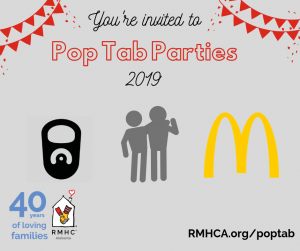 When asked about their stay at the Ronald McDonald House, Becky said, “They made sure we had plenty to eat, plenty of things for us to do such as crafts, coloring, etc. and had three Hand in Paw therapy dogs to come visit one night.” Summer is learning how to walk and her Mom is still not giving up on her. She is currently using canes, but with continued physical therapy will be walking without them in no time. You can help a family like Summer’s stay close to the care they need and to each other, by giving to our Adopt-a-Family program. It costs RMHCA $95/night per family to provide the services they need – with 41 rooms, the cost adds up quickly. Any donation helps!